We in the Bird Division are very lucky. If we get the urge to go birding, all we have to do is step outside. For museum visitors, you can see both of the Gidwitz Hall of Birds inside the museum and a variety of wild birds outside. The local area, affectionately referred to as the Greater Grant Park Ecosystem (a term coined by Doug Stotz), includes some truly great birding areas and a bird list some 285 birds long. The map and descriptions below highlight some of the best areas; a larger and printable version of the map and the Greater Grant Park Ecosystem birdlist are downloadable from the right sidebar. 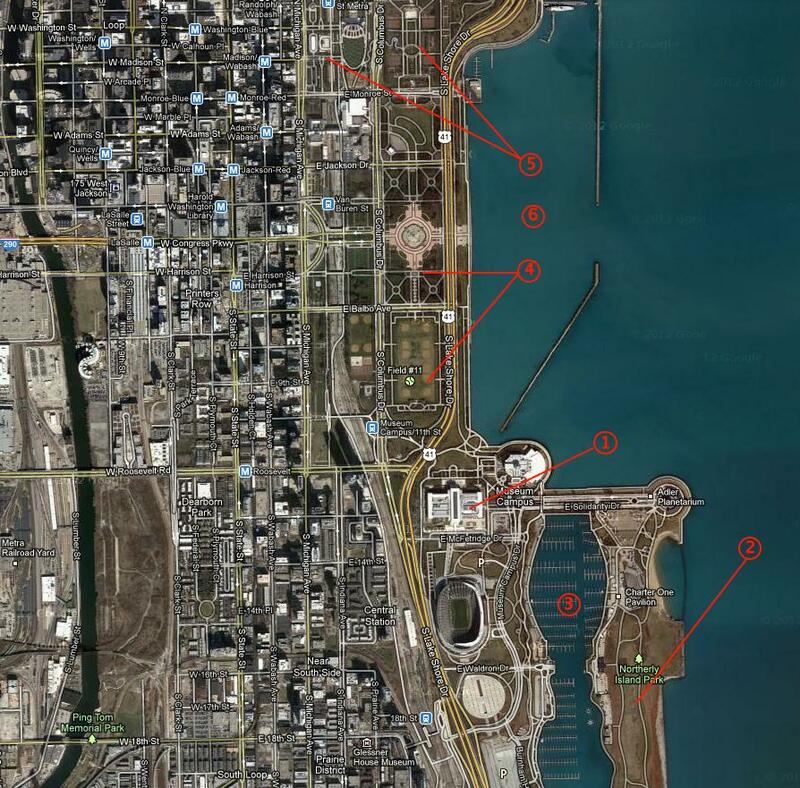 1) The Field Museum and Museum Campus: All around the Field Museum and the adjacent Shedd Aquarium are trees and bushes that are worth checking for migrants from about March-May and August-November. The best areas are all around the aquarium, the trees on the north and east side of the Field Museum, the south side of Solidarity Drive between the Field Museum and the Adler Planetarium, and the plantings along the west side of Burnham Harbor. Basically, anywhere on the museum campus! Birds to look for include warblers, thrushes, sparrows, vireos, and other small passerines. 2) Hands down the best place for birdwatching in the Greater Grant Park Ecosystem is Northerly Island, a 91-acre lakefront park managed by the Chicago Park District that was an airport until 2006. It has good year-round birding, although it is at its best during the same migration periods as listed for The Field Museum above. The habitat consists of grasslands with scattered trees, with more trees and bushes along the immediate lakeshore. Among local birders, it is famous for its uncommon grassland sparrows, including Nelson's, Le Conte's, and Henslow's. It is good for a wide variety of migrant birds, including birds typical of both forests (cuckoos, warblers, and vireos, for example) and grasslands (like sparrows, wrens, and Short-eared Owl). The open habitat is also inviting for birds of prey in fall and winter, and occasionally Short-eared Owl and Northern Shrike will spend the winter. Mostly surrounded by water, those areas can have ducks, loons, and rare gulls. 3) Burnham Harbor can be viewed from Northerly Island and from the Museum Campus. From mid-October through March, as long it's not packed with ice, it can have a variety of ducks, grebes, and gulls. It tends to be best from late January to late March. 4) Grant Park is the large metropolitan park that buffers Lake Michigan from downtown Chicago. Although the vegetation is heavily manicured, a walk through the park during migration can be very productive for warblers, sparrows, and other migrants. Some of the better areas include the plantings around Buckingham Fountain in the center of the park and the trees on the west and south sides of the softball diamonds at the south end of the park. 5) At the north end of Grant Park are Millennium Park (famous for the Bean statue and its Frank Gehry-designed music pavilion) and Daley Bicententennial Plaza. Both of these parks can also be excellent for mi grant passerines and are popular with birders who work in downtown Chicago and want to get in some birding before work or during their lunch hour. 6) Monroe Harbor, like Burnham Harbor, can be good from late fall through early spring for waterbirds, including ducks, grebes, and gulls. There are often ducks like mergansers, scaup, and goldeneye eating fish and mollusks close to shore. Birders also like visiting in the winter and early spring to look for rare gulls like Iceland, Lesser Black-backed, and Thayer's. Northerly Island has a history of attracting rare birds. Photo by Josh Engel. The combination of grasslands, trees, and a lakefront location makes Northerly Island a great birding spot. Photo by Josh Engel. Occasionally other geese show up in the flock of resident Canada Geese. Photo by Josh Engel. Local birders come to Northerly Island to look for sparrows in the genus Ammodramus. Photo by Josh Engel. Northwest winds in the fall bring birds of prey through the Chicago area. Photo by Josh Engel. Many winged creatures other than birds are migratory. Photo by Josh Engel.